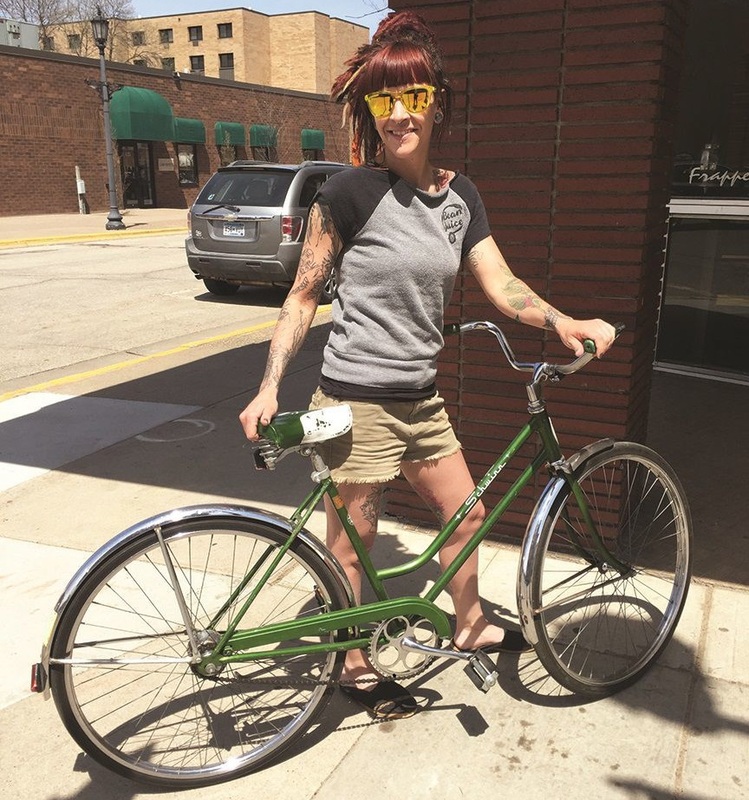 It’s bike month in Winona and fun anytime of the year to visit! Celebrating communities coast to coast with National Bike Month, we wanted to share what residence of Winona, MN are saying. A Bronze Bike Friendly Community, this area offers many bike related activities for you to enjoy any time of the year while visiting. Located in Southeast Minnesota along the Mississippi River, the city is a very comfortable place to explore on two wheels. 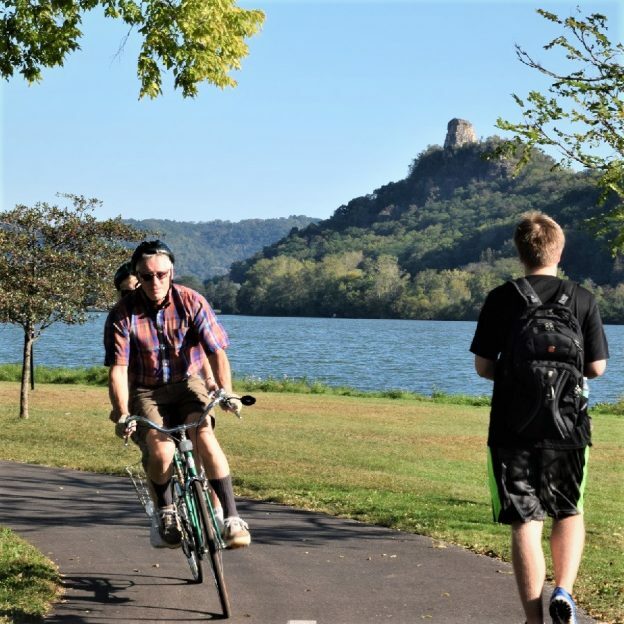 Thanks to Pam Eyden, who profiled the following cyclist, we think you will agree that Winona is a place to consider while visiting with your bike. Don’t miss the fun, also check their May Bike Month web page www.visitwinona.com/may-is-bike-month to find out what’s happening. Kay Peterson, client services coordinator at Winona Volunteer Services, loves bicycle riding. She has six bikes — a road bike, a fat-tire bike, two mountain bikes, a winter bike with used snowmobile bar mitts to cover her arms, and her everyday bike, which she calls her “horse.” She rides her horse to work, a four-mile round trip most days. She rides all year, even in the depths of winter, when wind chill temperatures are way below zero, in blizzards, ice, snow, wind and rain. She’s got the gear, she’s got the clothes and swears she never gets cold. Or not very cold. Biking clears her mind, she said. New ideas come to her while she’s wheeling down the street. In the summer she also loves gardening. “Biking and gardening are always competing for my time,” she laughed. A few years ago a friend persuaded her to try mountain biking. She soon came to love the challenge and the thrill of it. Her favorite trails are at Cherry Hill, in the Bronk Unit (location). “It’s a hidden gem,” she said. Emily lives just a couple of miles away from work and could easily drive or walk, but biking is best. She also rides her bike to do errands, like to pick up a few things at Target. She carries purchases home in her backpack, which works fine, she said, because she’s not a person who likes to buy a lot of new stuff. She prefers the side streets and always rides defensively. “I trust that no one will hit me, but I watch everything,” she stated. 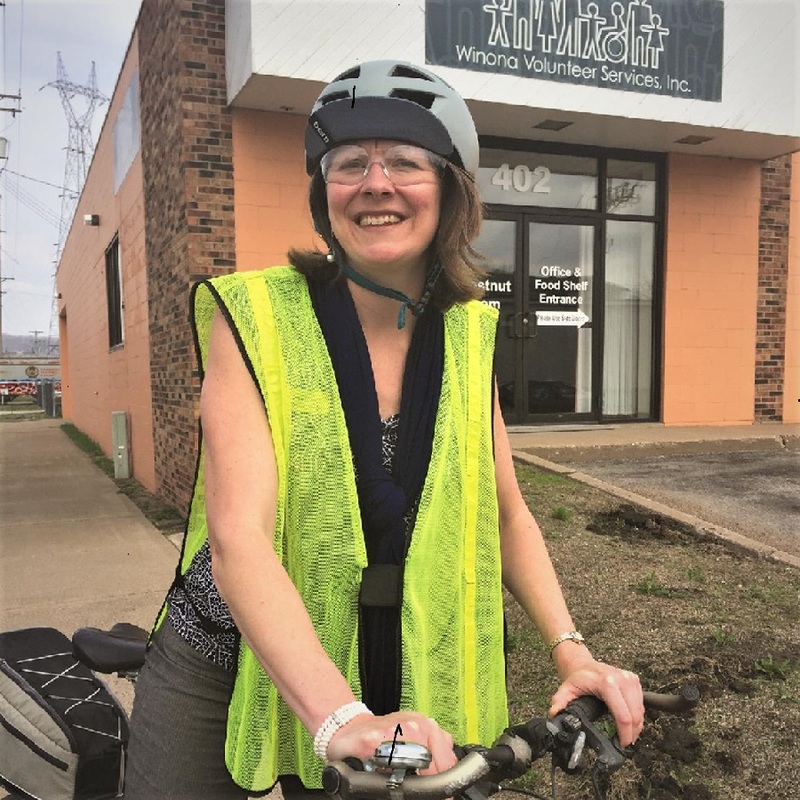 After work she enjoys touring around Lake Winona and out to Prairie Island on a 13-mile loop near the river that passes the Minnesota City Boat Club and the airport. 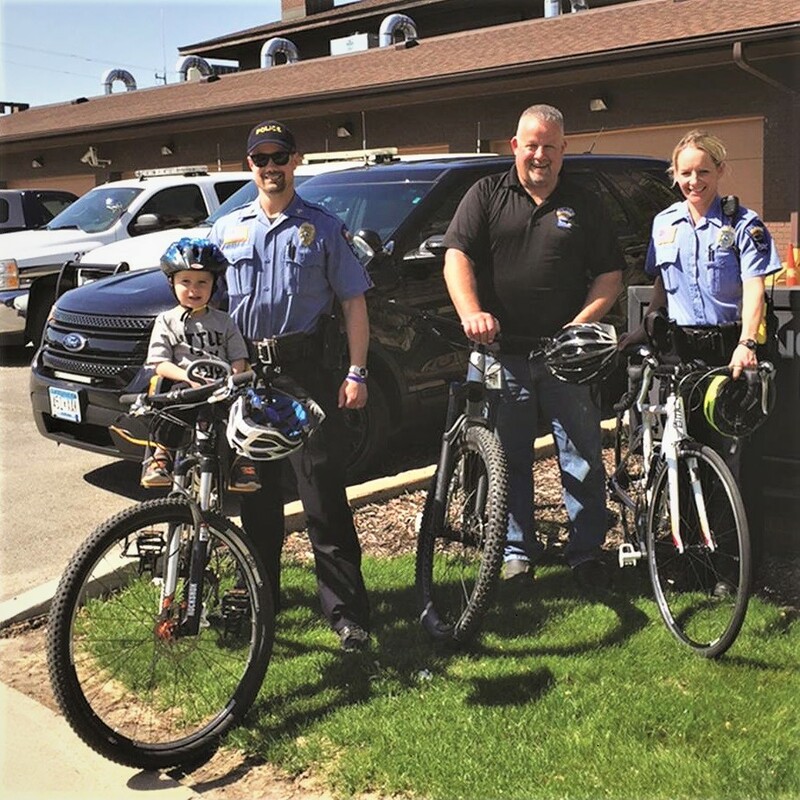 Bicycling has become part of the culture at the Winona Police Department. Twelve of the department’s staff are avid road bikers, mountain bikers or both. Here Paul Bostrack, Anita Sobotta and Jay Rasmussen from the department share their experiences. Many of the Winona Police Department staff are avid cyclists. For patrol officer Anita Sobotta, road biking through the hills and valleys of both Trempealeau and Buffalo Counties in Wisconsin (across the river from Winona) is a welcome chance to get away from everything. It’s also a good workout, which she relishes. Besides biking, Anita runs those same hills, and is training for a marathon race. She always wears a helmet, but would not ride her bike in town because she doesn’t like riding in traffic. 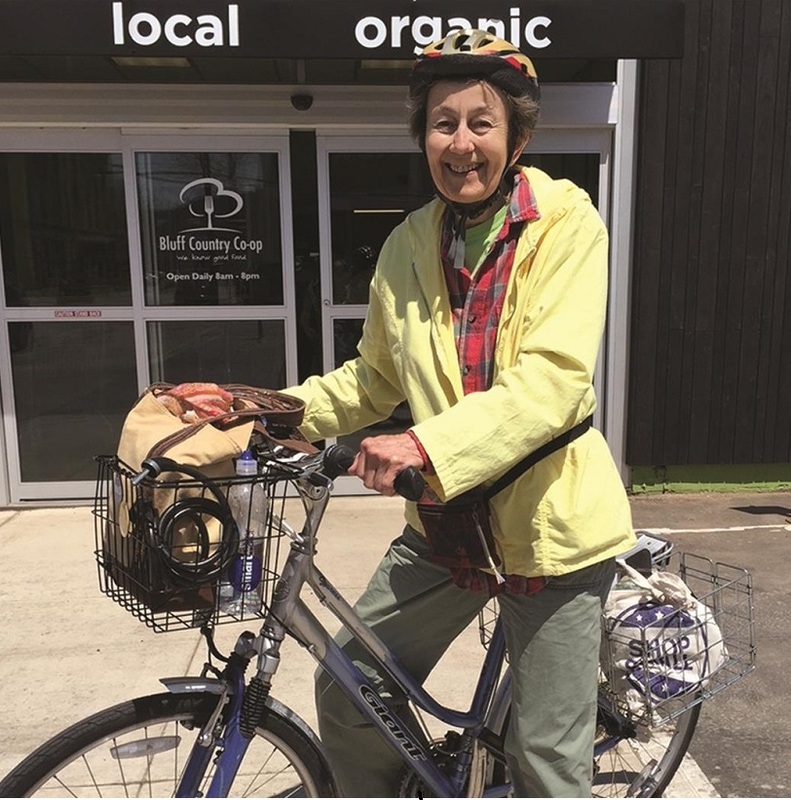 She used to go on biking adventures with her husband and she also rode with the bike group at the Winona Friendship Center. One of her four daughters leads bicycling tours in Europe, but biking is just a part of everyday life for Jo. She’s happy riding her bike to the Center in Winona to play ping-pong. “As a child, I had training wheels on my bike until I was in seventh grade!” she said. “I didn’t give them up until my friends wanted to go on a picnic at Mayowood. Then I learned. I was not going to ride with training wheels on my bike that day! Jo is quite comfortable riding at her own speed, on side streets, but she’s watchful. Sheldon Morgan discovered the sport of mountain biking in the late 1980s and has been doing it ever since. 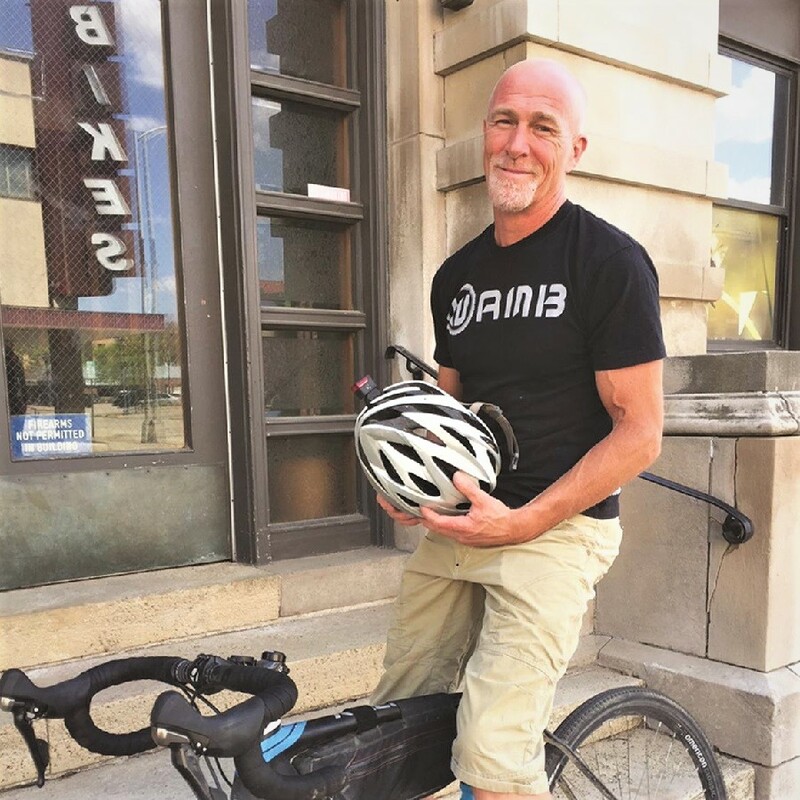 Now he rides his mountain bike at least eight hours a week and travels to other parts of the country for trail events and races, besides organizing rides here in Winona. Sheldon commutes 20-mile round trip with his everyday bike. Mountain biking is number one for him. Trails put him closer to nature, which he enjoys. Riding through the woods is solitary and challenging. Endorphins and risk are also addictive. “Even riding the same trails, you can always improve your speed, your grace, and your not-falling!” he said. In early May he organized the Hillbilly Gravel Grinder, a 100-mile ride on the gravel county roads of Winona, Fillmore and Houston Counties. About 25 people started out at 9 a.m. and most completed the route by 6 — nine hours, including breaks. People enjoy the county roads because there isn’t as much traffic. “I ride for the mental stability and the exercise. I like to run, too, but I can’t run as long or as far as I can ride,” Sheldon said. Over the years, Sheldon has developed an interest in and an expertise in trail design. He and a partner formed a business, Dirty Deeds Earth Services, LLC, to help with trail maintenance and design at Holzinger Park, which, he says has “old school” trails, not well designed to counter erosion. 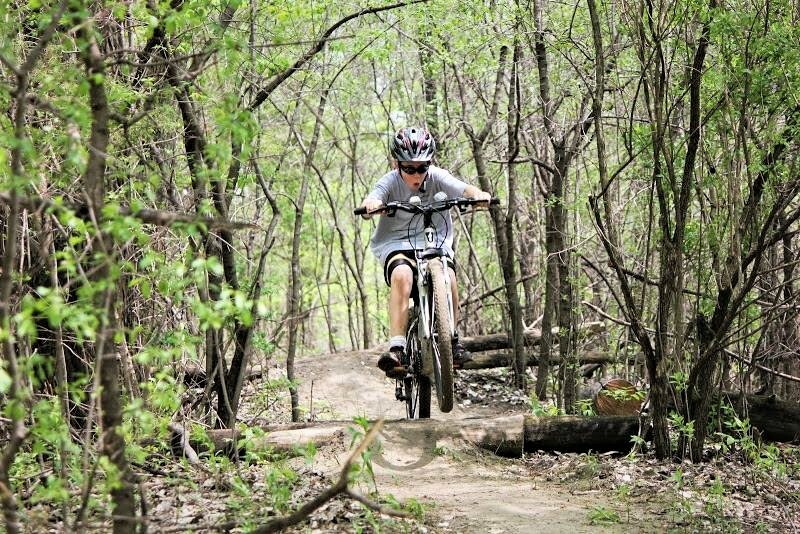 He’s also helped the city at Sugar Loaf and has designed and created single-track mountain biking trails at the Bronk Unit of Minnesota’s Richard Dorer State Forest. This area, called Cherry Hill, is one of his favorites in the area. Trails at Holzinger and Sugar Loaf will get a new, close examination for sustainability during the Winona City park planning process this summer. He and his 26-year-old ride together, as they have for years. They go on mountain bike journeys together, riding and camping, and taking a break once in a while for rock climbing. Biking, rock climbing, running and kayaking — he loves it all. “And it’s all right here in Winona!” he exults. Come for the trails, see the views, then stay stay for the hospitality. May is National Bike Month, sponsored by the League of American Bicyclists and celebrated in communities from coast to coast. Established in 1956, National Bike Month is a chance to showcase the many benefits of bicycling — and encourage more folks to giving biking a try. National Bike to Work Week 2018 will be held from May 14–18. Bike to Work Day is May 18! This entry was posted in News and tagged Anita Sbotta, Bicycle Aliance of MN, Bike Month, BikeMN, Emily Krall, Jay Rasmussen, Jo McGrath, Kay Peterson, League of American Bicyclist, Mississippi River Trail town, Pam Eyden, Paul Bostrack, Visit Winona, Winona MN on May 14, 2018 by Russ Lowthian.